St Elizabeth's Church or better known as the ‘Blue Church’ was built in early 20th century and is one of the buildings in the city which simply stands out against its backdrop! 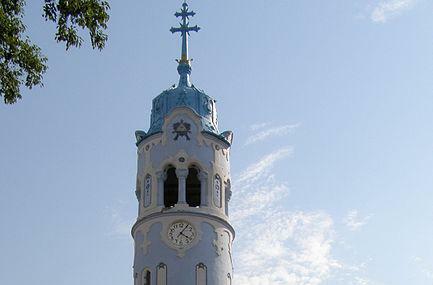 The vibrant blue colors which embellishes the building’s white walls is what gives it its iconic name and even though you may not be able to enter the premises, a walk along the church is perfect to capture a few photos of its heavenly beauty! If you visit the church during mass timings, take a walk inside to appreciate its interiors as well. Recommended time of arrival from 9.00 am to 5.00 pm. The place is open only during specific mass timings. For more information, call up the place or visit the official website. Light Rail: At Kamenne nam. How popular is Church Of St. Elisabeth? People normally club together Old Town Hall and Grassalkovich Palace while planning their visit to Church Of St. Elisabeth. People also prefer to end their day with Church Of St. Elisabeth. Very beautiful and interesting church. Never seen anything like it in my life. Worth seeing if you're into architecture. No photo will do it justice. The facade colours are something you don't usually see. If you're ever in Bratislava definitely visit. I promised myself that if I'm going to marry, I'll marry here in this church even though I'm not christian. (Actually I have no religion.) When I visited there, the church was closed and I almost cried out of sadness. From the outside part, the church looks amazingly pretty. For the inside part, it's even more beautiful. The name 'blue church' is the perfect description of this church because it's a church, and its color is (beautiful light) blue. As Bratislava is a small city, you have plenty of time to look at this church thoroughly. There is story behind the blue facade and the church could do a lot more to promote it. Try to visit when it is actually open. Best time is our before mass. On Saturday your chances of running into a wedding are extremely high :-) The school next to the church is actually just as architectonically interesting. When we got there, the church was locked. So, we couldn't get in it. From the outside is stunningly beautiful and different from any other church you've seen. Just next to it there is a school with the same style. The school has its own sun clock.